I recently read Lutz Bacher’s article on Max Ophüls in Undercurrent (you can read it here), which focuses on the director’s movements from Europe to the United States and back again and discusses changes in Ophüls’s visual style. 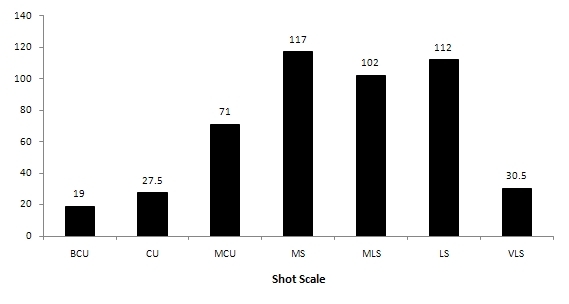 This piece refers directly to Barry Salt’s data for shot scales (the database is here), but then does not seem to actually do anything with this information. 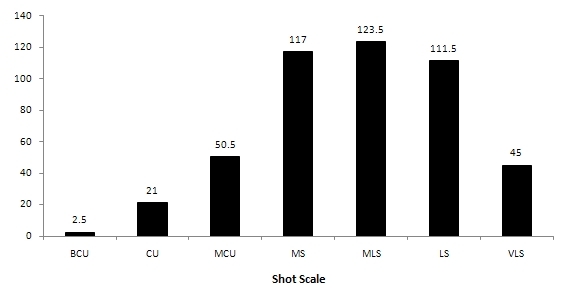 There is some discussion of shot movement, but after the introductory part of the essay the issue of closeness of shot and variation of shot scales seems to be dropped. It occurred to me that it would be interesting to present the relevant information for Ophüls’s shot scales in a similar fashion to that of other directors/periods/countries I have done before, and so here it is. These statistics are useful for describing Ophüls films in a general sense, but due to the small number of films they should be treated with a modicum of caution. 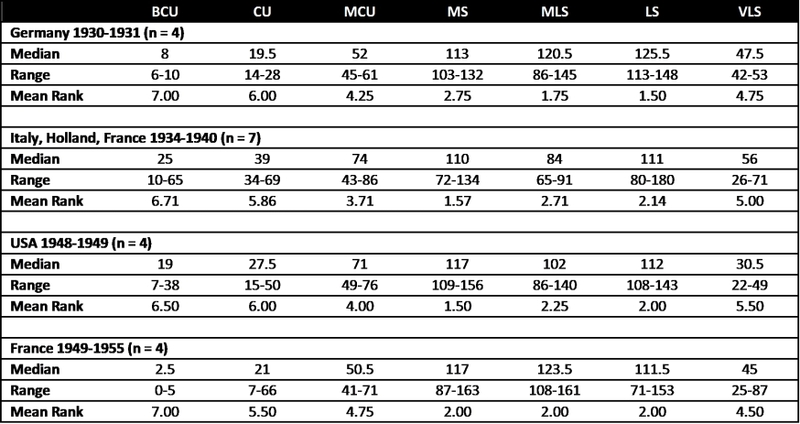 Table 1 shows consistency across Ophüls’s films from Germany 1930-1931 and the USA 1948-1949, but both these periods in Ophüls’s career appear to show some difference to the two periods Ophüls spent in France (I have included one Italian and one Dutch film in the sample for 1934-1940). The confidence intervals for the German and American films do not include the slope and intercept values for Italy, Holland, France 1934-1940 or for the French films of the 1950s. These two (predominantly) French periods of Ophüls’s career also appear to be different from one another. Ophüls’s films are consistent with an earlier study on German and Hollywood cinema, suggesting there the director is consistent with these two national styles which had converged by the 1930s. 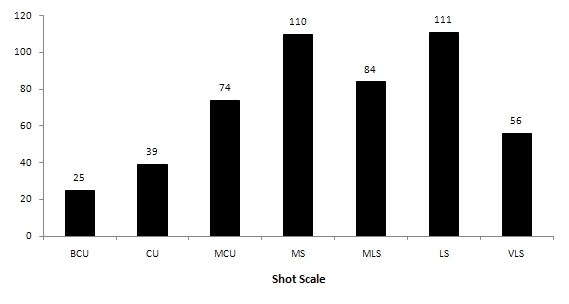 The reason for the difference noted in the French films could be that there was a different style of use of shot scales, and that this style had changed from the 1930s to the 1950s, but I have not seen any evidence to support this. The linear model is a good fit in every case (see Figures 1 through 4), although due to the small sample size the confidence intervals for the mean relative frequency are inevitably somewhat large. FIGURE 1 Rank-frequency plot of shot scales for the films of Max Ophüls, Germany 1930-1931. 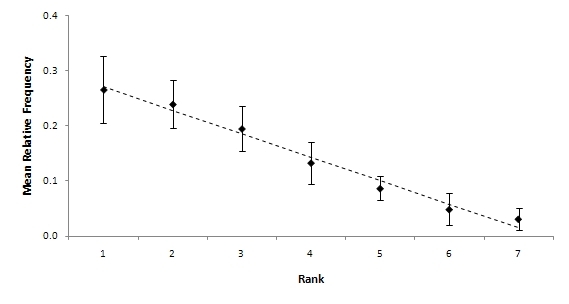 The error bars are the 95% confidence interval. FIGURE 2 Rank-frequency plot of shot scales for the films of Max Ophüls, Italy, Holland, France 1934-1940. 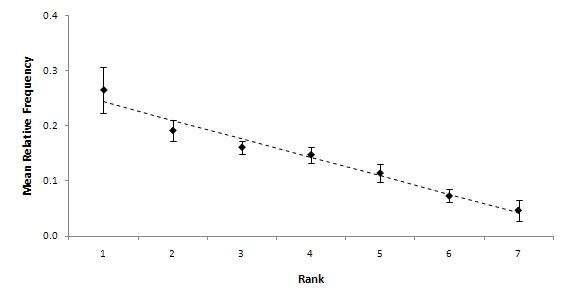 The error bars are the 95% confidence interval. 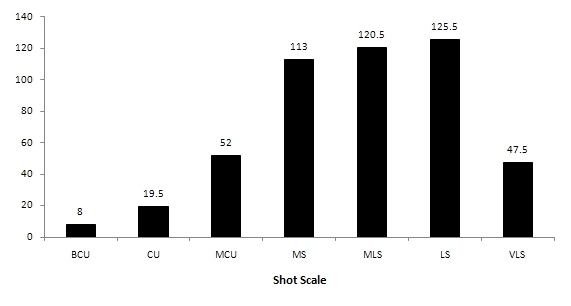 FIGURE 3 Rank-frequency plot of shot scales for the films of Max Ophüls, USA 1948-1949. 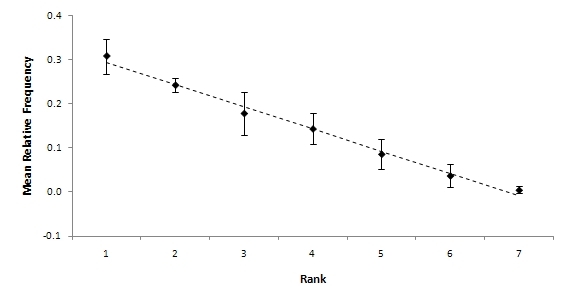 The error bars are the 95% confidence interval. FIGURE 4 Rank-frequency plot of shot scales for the films of Max Ophüls, France 1950-1955. 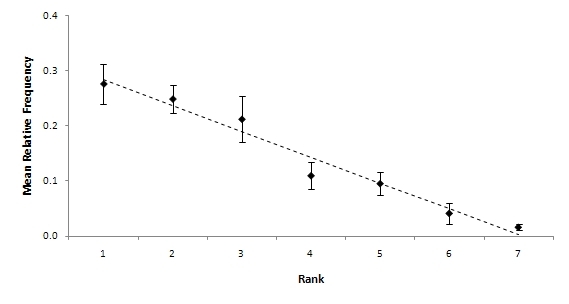 The error bars are the 95% confidence interval. If we look at the shot scales themselves (Figures 5 through 8), we can see that Ophüls’s films have been dominated by three scales – medium shots, medium long shots, and long shots – and that this style did not vary according to which industry or time period Ophüls was directing. The only variations that really leap out are (1) the drop in the use of medium shots in the period 1934-1940; and (2) the use of medium close-ups in the European films of the period 1934-1940 and the American films: in these two periods of Ophüls’s career the use of MCUs is greater relative to the other German films or the French films of the 1950s. In his article, Bacher discusses Ophüls’s use of a moving camera but does not refer to Salt’s data for camera movements in Ophüls’s films either. Unfortunately, Ophüls did not produce enough films to be able to compare his of moving shots statistically, and the samples are just too small to get a powerful result from an analysis of variance, and so a statistical analysis is not appropriate. Bacher L 2006 Max Ophüls’s adaptation to and subversion of classical Hollywood cinema and their effect on his European filmmaking, Undercurrent 3: http://www.fipresci.org/undercurrent/issue_0306/bacher_ophuls.htm, accessed 25 March 2010.